The attention of Abraham's servant was attracted by the courteous manners of Rebekah. As she came from the well, he met her and asked for a drink of water from the pitcher on her shoulder. Abraham had become an old man, and expected soon to die; yet one act remained for him to do in securing the fulfillment of the promise to his posterity. Isaac was the one divinely appointed to succeed him as the keeper of the law of God and the father of the chosen people, but he was yet unmarried. The inhabitants of Canaan were given to idolatry, and God had forbidden intermarriage between His people and them, knowing that such marriages would lead to apostasy. The patriarch feared the effect of the corrupting influences surrounding his son. Abraham's habitual faith in God and submission to His will were reflected in the character of Isaac; but the young man's affections were strong, and he was gentle and yielding in disposition. If united with one who did not fear God, he would be in danger of sacrificing principle for the sake of harmony. In the mind of Abraham the choice of a wife for his son was a matter of grave importance; he was anxious to have him marry one who would not lead him from God. In ancient times marriage engagements were generally made by the parents, and this was the custom among those who worshiped God. None were required to marry those whom they could not love; but in the bestowal of their affections the youth were guided by the judgment of their experienced, God-fearing parents. It was regarded as a dishonor to parents, and even a crime, to pursue a course contrary to this. Isaac, trusting to his father's wisdom and affection, was satisfied to commit the matter to him, believing also that God Himself would direct in the choice made. The patriarch's thoughts turned to his father's kindred in the land of Mesopotamia. Though not free from idolatry, they cherished the knowledge and the worship of the true God. Isaac must not leave Canaan to go to them, but it might be that among them could be found one who would leave her home and unite with him in maintaining [p. 172] the pure worship of the living God. Abraham committed the important matter to "his eldest servant," a man of piety, experience, and sound judgment, who had rendered him long and faithful service. He required this servant to make a solemn oath before the Lord, that he would not take a wife for Isaac of the Canaanites, but would choose a maiden from the family of Nahor in Mesopotamia. He charged him not to take Isaac thither. If a damsel could not be found who would leave her kindred, then the messenger would be released from his oath. The patriarch encouraged him in his difficult and delicate undertaking with the assurance that God would crown his mission with success. "The Lord God of heaven," he said, "which took me from my father's house, and from the land of my kindred, . . . He shall send His angel before thee." The messenger set out without delay. Taking with him ten camels for the use of his own company and the bridal party that might return with him, provided also with gifts for the intended wife and her friends, he made the long journey beyond Damascus, and onward to the rich plains that border on the great river of the East. Arrived at Haran, "the city of Nahor," he halted outside the walls, near the well to which the women of the place came at evening for water. It was a time of anxious thought with him. Important results, not only to his master's household, but to future generations, might follow from the choice he made; and how was he to choose wisely among entire strangers? Remembering the words of Abraham, that God would send His angel with him, he prayed earnestly for positive guidance. In the family of his master he was accustomed to the constant exercise of kindness and hospitality, and he now asked that an act of courtesy might indicate the maiden whom God had chosen. Hardly was the prayer uttered before the answer was given. Among the women who were gathered at the well, the courteous manners of one attracted his attention. As she came from the well, the stranger went to meet her, asking for some water from the pitcher upon her shoulder. 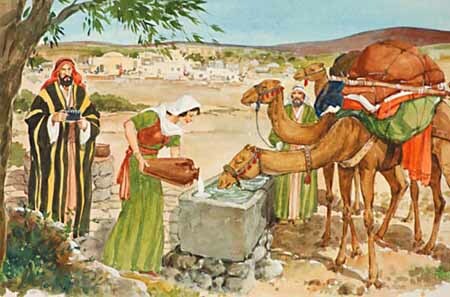 The request received a kindly answer, with an offer to draw water for the camels also, a service which it was customary even for the daughters of princes to perform for their fathers' flocks and herds. Thus the desired sign was given. The maiden "was very fair to look upon," and her ready courtesy gave evidence of a kind heart and an active, energetic [p. 173] nature. Thus far the divine hand had been with him. After acknowledging her kindness by rich gifts, the messengers asked her parentage, and on learning that she was the daughter of Bethuel, Abraham's nephew, he "bowed down his head, and worshiped the Lord." The man had asked for entertainment at her father's house, and in his expressions of thanksgiving had revealed the fact of his connection with Abraham. Returning home, the maiden told what had happened, and Laban, her brother, at once hastened to bring the stranger and his attendants to share their hospitality. Eliezer would not partake of food until he had told his errand, his prayer at the well, with all the circumstances attending it. Then he said, "And now, if ye will deal kindly and truly with my master, tell me: and if not, tell me; that I may turn to the right hand, or to the left." The answer was, "The thing proceedeth from the Lord: we cannot speak unto thee bad or good. Behold, Rebekah is before thee; take her, and go, and let her be thy master's son's wife, as the Lord hath spoken." After the consent of the family had been obtained, Rebekah herself was consulted as to whether she would go to so great a distance from her father's house, to marry the son of Abraham. She believed, from what had taken place, that God had selected her to be Isaac's wife, and she said, "I will go." The servant, anticipating his master's joy at the success of his mission, was impatient to be gone; and with the morning they set out on the homeward journey. Abraham dwelt at Beersheba, and Isaac, who had been attending to the flocks in the adjoining country, had returned to his father's tent to await the arrival of the messenger from Haran. "And Isaac went out to meditate in the field at the eventide: and he lifted up his eyes, and saw, and, behold, the camels were coming. And Rebekah lifted up her eyes, and when she saw Isaac, she lighted off the camel. For she had said unto the servant, What man is that that walketh in the field to meet us? And the servant had said, It is my master: therefore she took a veil, and covered herself. And the servant told Isaac all things that he had done. And Isaac brought her into his mother Sarah's tent, and took Rebekah, and she became his wife; and he loved her: and Isaac was comforted after his mother's death." Abraham had marked the result of the intermarriage of those who feared God and those who feared Him not, from the days of [p. 174] Cain to his own time. The consequences of his own marriage with Hagar, and of the marriage connections of Ishmael and Lot, were before him. The lack of faith on the part of Abraham and Sarah had resulted in the birth of Ishmael, the mingling of the righteous seed with the ungodly. The father's influence upon his son was counteracted by that of the mother's idolatrous kindred and by Ishmael's connection with heathen wives. The jealousy of Hagar, and of the wives whom she chose for Ishmael, surrounded his family with a barrier that Abraham endeavored in vain to overcome. Abraham's early teachings had not been without effect upon Ishmael, but the influence of his wives resulted in establishing idolatry in his family. Separated from his father, and embittered by the strife and contention of a home destitute of the love and fear of God, Ishmael was driven to choose the wild, marauding life of the desert chief, "his hand" "against every man, and every man's hand against him." Genesis 16:12. In his latter days he repented of his evil ways and returned to his father's God, but the stamp of character given to his posterity remained. The powerful nation descended from him were a turbulent, heathen people, who were ever an annoyance and affliction to the descendants of Isaac. The wife of Lot was a selfish, irreligious woman, and her influence was exerted to separate her husband from Abraham. But for her, Lot would not have remained in Sodom, deprived of the counsel of the wise, God-fearing patriarch. The influence of his wife and the associations of that wicked city would have led him to apostatize from God had it not been for the faithful instruction he had early received from Abraham. The marriage of Lot and his choice of Sodom for a home were the first links in a chain of events fraught with evil to the world for many generations. He who has entered the marriage relation while unconverted, is by his conversion placed under stronger obligation to be faithful to his companion, however widely they may differ in regard to religious faith; yet the claims of God should be placed above every earthly relationship, even though trials and persecution may be the result. With the spirit of love and meekness, this fidelity may have an influence to win the unbelieving one. But the marriage of Christians with the ungodly is forbidden in the Bible. The Lord's direction is, "Be ye not unequally yoked together with unbelievers." 2 Corinthians 6:14, 17, 18. Isaac was highly honored by God in being made inheritor of the promises through which the world was to be blessed; yet when he was forty years of age he submitted to his father's judgment in appointing his experience, God-fearing servant to choose a wife for him. And the result of that marriage, as presented in the Scriptures, is a tender and beautiful picture of domestic happiness: "Isaac brought her into his mother Sarah's tent, and took Rebekah, and she became his wife; and he loved her: and Isaac was comforted after his mother's death." What a contrast between the course of Isaac and that pursued by the youth of our time, even among professed Christians! Young people too often feel that the bestowal of their affections is a matter in which self alone should be consulted—a matter that neither God nor their parents should in any wise control. Long before they have reached manhood or womanhood they think themselves competent to make their own choice, without the aid of their parents. A few years of married life are usually sufficient to show them their error, but often too late to prevent its baleful results. For the same lack of wisdom and self-control that dictated the hasty choice is permitted to aggravate the evil, until the marriage relation a galling yoke. Many have thus wrecked their happiness in this life and their hope of the life to come. Parents should never lose sight of their own responsibility for the future happiness of their children. Isaac's deference to his [p. 176] father's judgment was the result of the training that had taught him to love a life of obedience. While Abraham required his children to respect parental authority, his daily life testified that that authority was not a selfish or arbitrary control, but was founded in love, and had their welfare and happiness in view. Fathers and mothers should feel that a duty devolves upon them to guide the affections of the youth, that they may be placed upon those who will be suitable companions. They should feel it a duty, by their own teaching and example, with the assisting grace of God, to so mold the character of the children from their earliest years that they will be pure and noble and will be attracted to the good and true. Like attracts like; like appreciates like. Let the love for truth and purity and goodness be early implanted in the soul, and the youth will seek the society of those who possess these characteristics. Let parents seek, in their own character and in their home life, to exemplify the love and beneficence of the heavenly Father. Let the home be full of sunshine. This will be worth far more to your children than lands or money. Let the home love be kept alive in their hearts, that they may look back upon the home of their childhood as a place of peace and happiness next to heaven. The members of the family do not all have the same stamp of character, and there will be frequent occasion for the exercise of patience and forbearance; but through love and self-discipline all may be bound together in the closest union. True love is a high and holy principle, altogether different in character from that love which is awakened by impulse and which suddenly dies when severely tested. It is by faithfulness to duty in the parental home that the youth are to prepare themselves for homes of their own. Let them here practice self-denial and manifest kindness, courtesy, and Christian sympathy. Thus love will be kept warm in the heart, and he who goes out from such a household to stand at the head of a family of his own will know how to promote the happiness of her whom he has chosen as a companion for life. Marriage, instead of being the end of love, will be only its beginning. Click here to read the next chapter: "Jacob and Esau"